My name is Catherine Loeffen and I am a Wood and temporary tattoo artisan. I have a B.S. degree in Apparel Manufacturing and Management from California Polytechnic University, Pomona. I was born on August 7th, 1979 to the parents of Elisa Solis of Mexican ancestry and Franklin Arthur Loeffen of Dutch-Indonesian descent. I am currently living and working in Los Angeles, CA. I own and run my own business, EternalGlyphics, where I handcraft art made out of wood, as well as free hand temporary tattoos using Henna and Jagua. 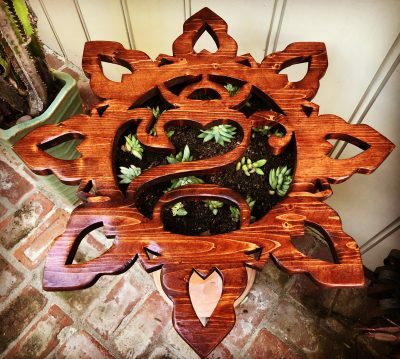 I have always loved wood art, but specifically looking back to 2004, when I first touched my feet on Indonesian soil (Bali), is where my inspiration for wood art began. I have some artwork on display at a group art show, all inspired by Dutch-Indonesian roots, in Pomona, CA at La Bomba Vintage. Please feel free to browse my website – www.eternalglyphics.com. My father was born in Bandung, Indonesia in 1950. 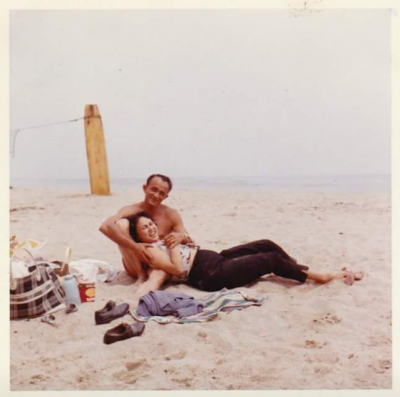 He left Indonesia to seek refuge in 1957 and went to Holland and then moved to Los Angeles, CA in 1961. He started attending Long Beach State in 1971, where he met my mother. 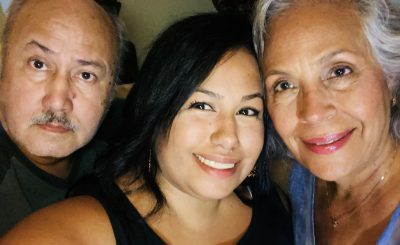 After dating for two years, they were married and had their first child, Marisa, in 1974. Three years later my middle sister, Natalya, was born in 1978. Lastly, my twin sister, Christine and I were born a year and a half later in Monterey Park. Within the first month of my birth our family moved from Pasadena to Altadena, to have more room for my twin and I. My Oma, Jani Rosmiah Jansen, was born in Tjemahi, Indonesia in 1927. She had 4 children on the island of Java, Myra in 1945, Roy in 1949, my dad in 1950, and then Jessica in 1952; and had her youngest child, Linda in Los Angeles in 1962. Oma first married at the young age of 20 and married two more times over her life time. Her second marriage was to my father’s Dad, Nicodemus Loeffen whom passed away just a few months after my dad was born. Oma met my Opa, Franciscus Jansen, during her early high school years, but the war split them up and they later found each other again before moving to the USA. They married in Los Angeles, CA in 1961 and moved to Dallas, OR in the late 1980s. They were happily married for almost 33 years before my Opa passed away in 1994. Oma then moved to Seal Beach, CA in 1997, to be closer to family and friends, and spent her remaining years there before she laid to rest on January 02, 2017. Food has forever been a BIG part of my life and although I was raised on Dutch Indonesian and Mexican food, my parents encouraged us to explore other cultures food and my love for food began. I can remember being introduced to Indonesian food by my Oma, hands down the BEST Dutch Indonesian cook I know. Lumpia, Gado Gado (salad), Soto Ayam (chicken dish), Roti Koekoe (sponge cake), Spekkoek (spice cake), Loempia (eggroll), Risolles (dessert), Tjendol (drink dessert) and Kroketjes (beef roll) were dishes I’d always ask her to make for me. It wasn’t until I was in college that I attempted to make my first Indonesian dish, Frikadel Djagoeng (shrimp and corn fritters). My Oma had a strong accent, even after being in the US for so many years, so calling her for a recipe, wasn’t the easiest task. Nor was it easy to find the right ingredients. We had just a few very small Indonesian markets throughout LA, Temple City and Bellflower that we’d find most of the products we needed to get the kitchen smelling like Oma’s house. Last year, my Dad gifted me a cookbook, Indo Dutch Kitchen Secrets by Jeff Keasberry. Since then my mother and I have attempted to keep the traditional Dutch-Indonesian food in the house by experimenting with several of the recipes in the cookbook and remembering Oma’s style of cooking. In 2004, for my college graduation gift, my mother suggested a family trip to Indonesia and without hesitation we had our tickets booked and set forth for our 21-hour flight to Bali. During our time there, we visited Ubud, the artist colony, where I fell in love with all the Mahogany wood work. The intricate carvings, wood inlays, furniture and jewelry were breathtaking. The craftsmanship and attention to detail were impeccable. I ended up purchasing so much, I had to buy another suitcase to bring everything back to home with me. My fondest memories from that trip was flying into Bandung, Java, meeting my Great Aunt and her immediate family for the first time and being able to see the street my Dad grew up on and the park he played at as a kid. 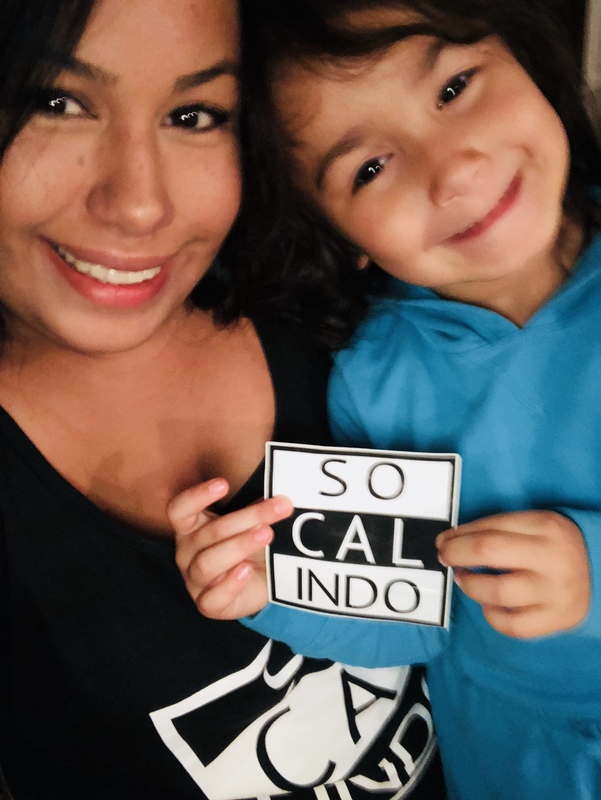 I plan to take my daughter to Indonesia one day and show her the beautiful landscape of the rice fields, eye opening trees at the monkey forest, aqua marine water of the black sand beaches, intricate architecture of the temples, active volcano, and the majestic mountain views. All that I saw in Indonesia help inspire me in my art until this day, almost 14 years later. I am very proud of my Dutch-Indonesian heritage and I hope to incorporate more and more of this rich culture into my life.